But, how can you truly see a place, really see anything if it has no context? 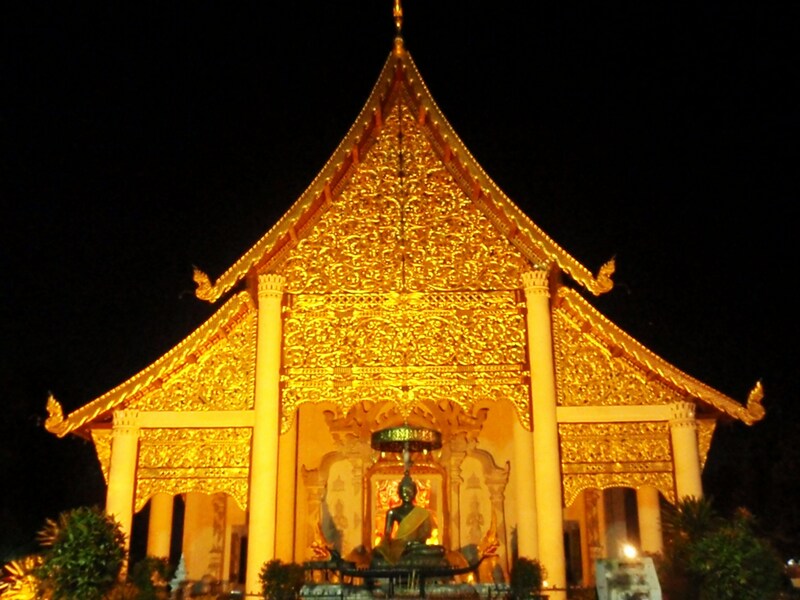 The lights of Chiang Mai were a halo on the horizon from our candle-lit existence above. To see the glow of the future and actively live in the flickering past must be strange indeed. In recent years, Thailand’s hill tribes have become something of a circus act for curious westerners. Yet, this poverty tour has had little effect on their basic existence. 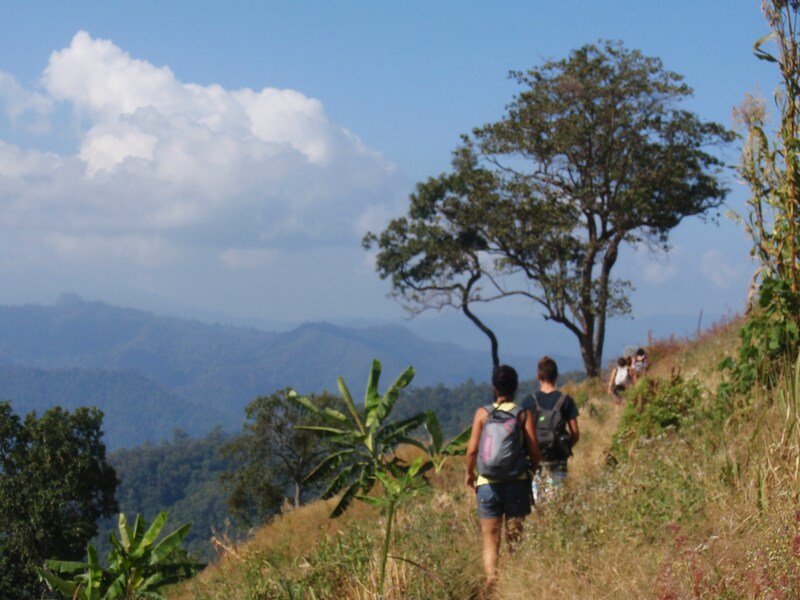 It took a full day of uphill trekking to reach the mountaintop village of Hoi Kup Kop. 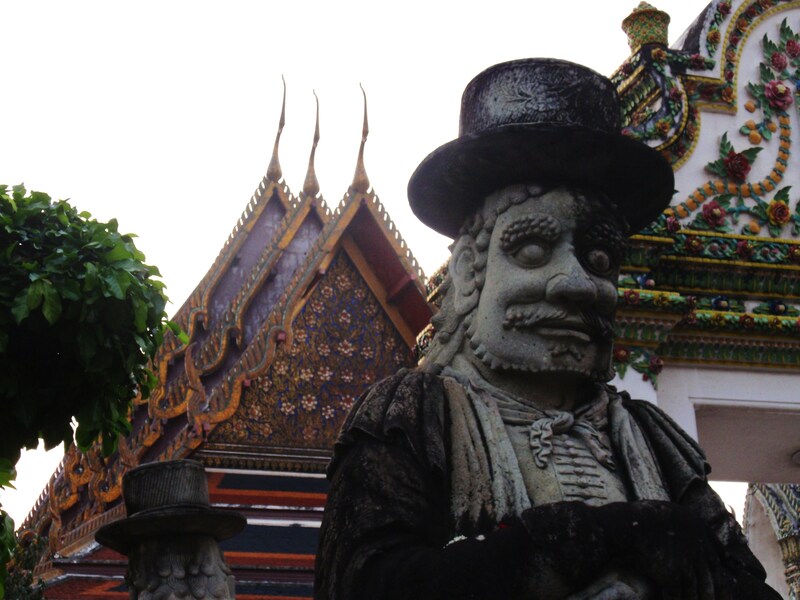 On an eight-man tour, we drove north from the moat-lined city of Chiang Mai leaving behind the old-world, gated opulence of the temple to temple city for the jungle. 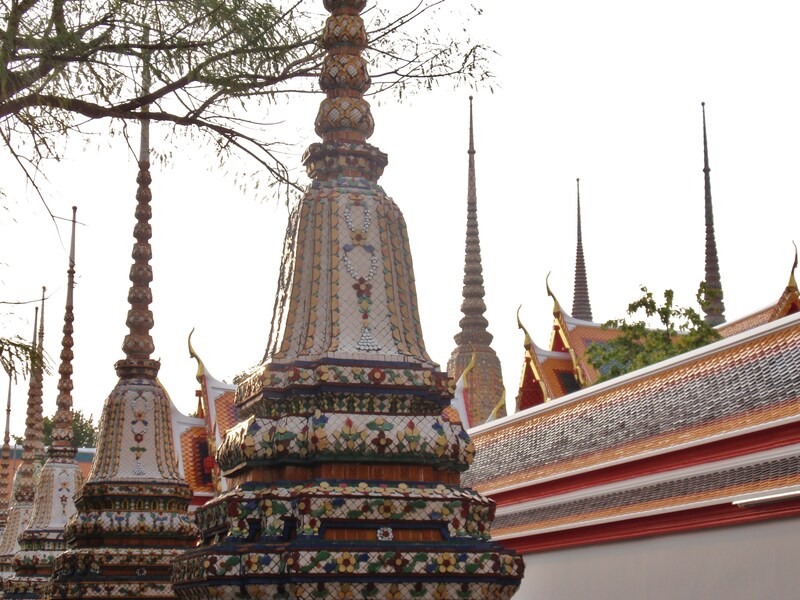 We traded the bookish intellect of the jewel city of Thailand for the simple pleasures of life in the tribes. 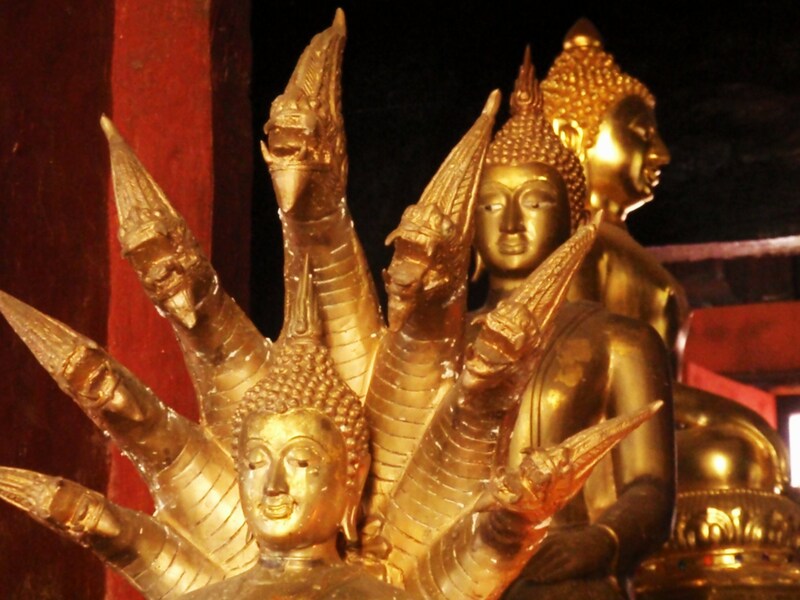 Chiang Mai attracts a different kind of tourist than the beach-lined coasts of the south. 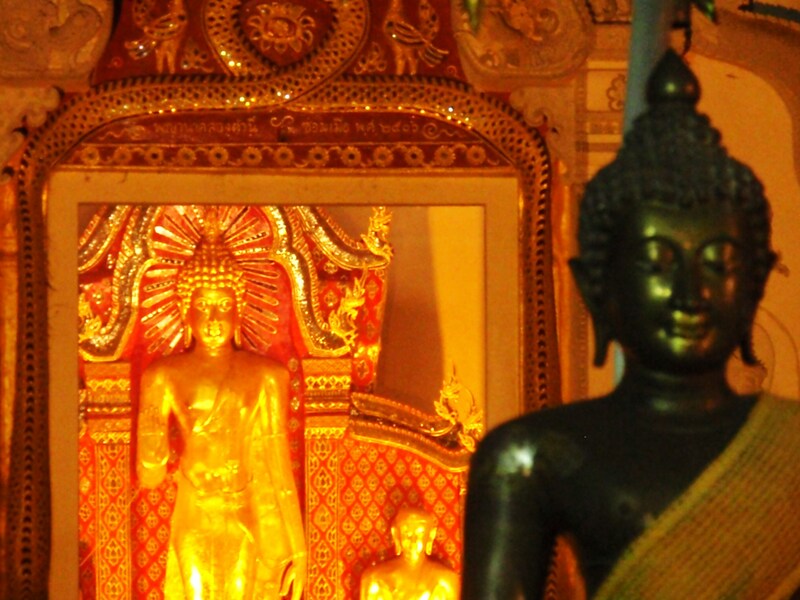 Travelers venture here to learn Thai massage, Thai cooking, muay Thai, or to embark on other intellectual pursuits. 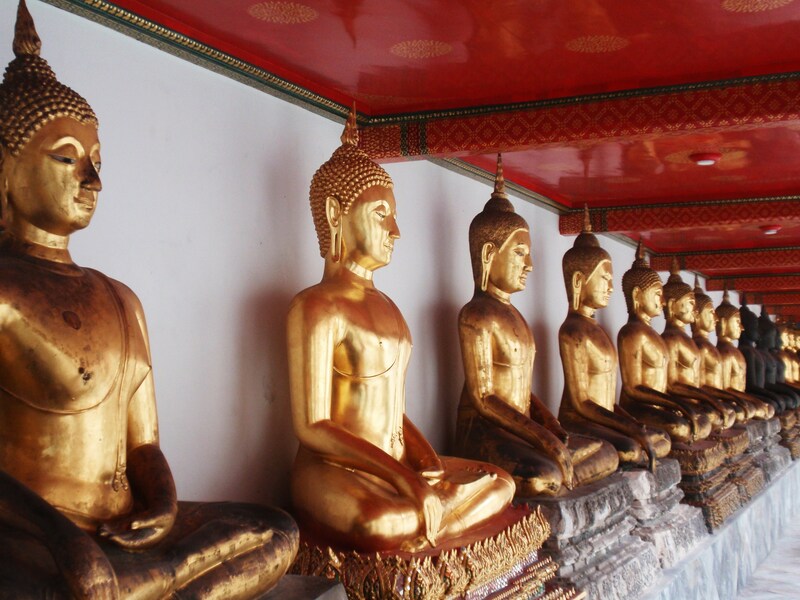 Its peaceful Buddhist charm offers wanders a chance to be still, to breath, and to understand the country and its culture in ways not possible in the tropical south. It also offers a surrounding landscape of tree-studded mountains with a people whose life has hardly been touched by modern times. The teetering girl’s smile curled all the way up her face to her bow-topped bald head. In her hand were four bunches of purple wildflowers, an impromptu welcome to her village. Like everyone here, she was improbably happy and incredibly curious. 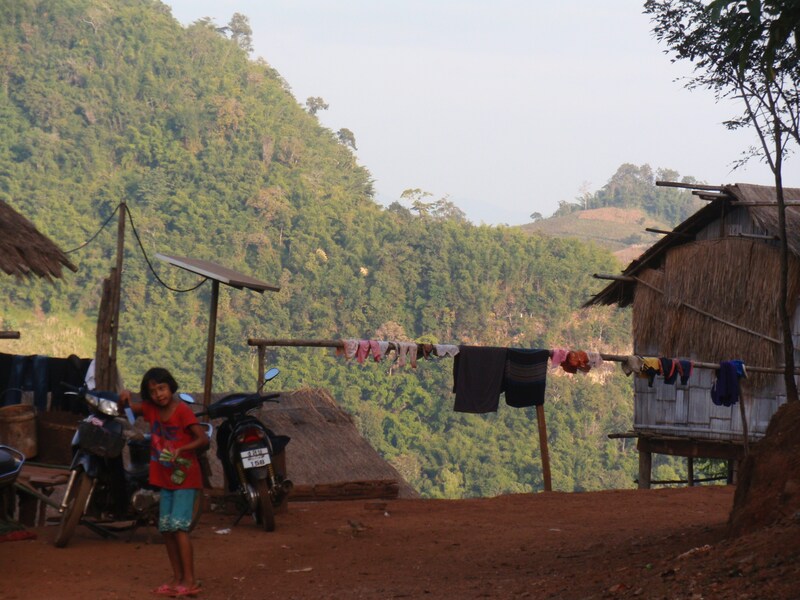 Six major hill tribes live separated into their own isolated pockets in the mountains of northern Thailand between the Burmese and Laos borders. 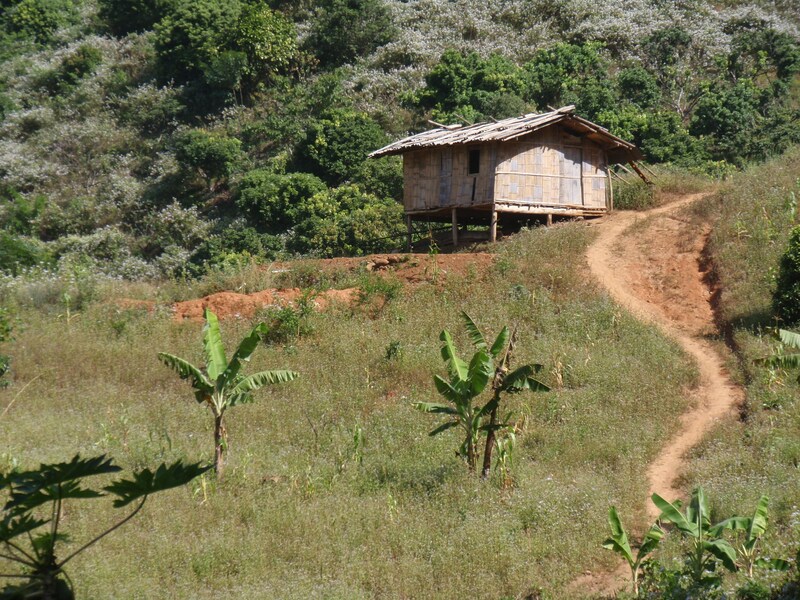 The Akha, Lahu, Karen, Hmong, Lisu, and Shen each have their own distinct language and culture. The Lahu people, whose hospitality I enjoyed, are of Tibetan origin. Forced out of Tibet, they migrated southeast to Burma where, faced with years of political turmoil, many crossed into northern Thailand. There are several sub-groups of Lahu and each are known by the traditional color of their dress. 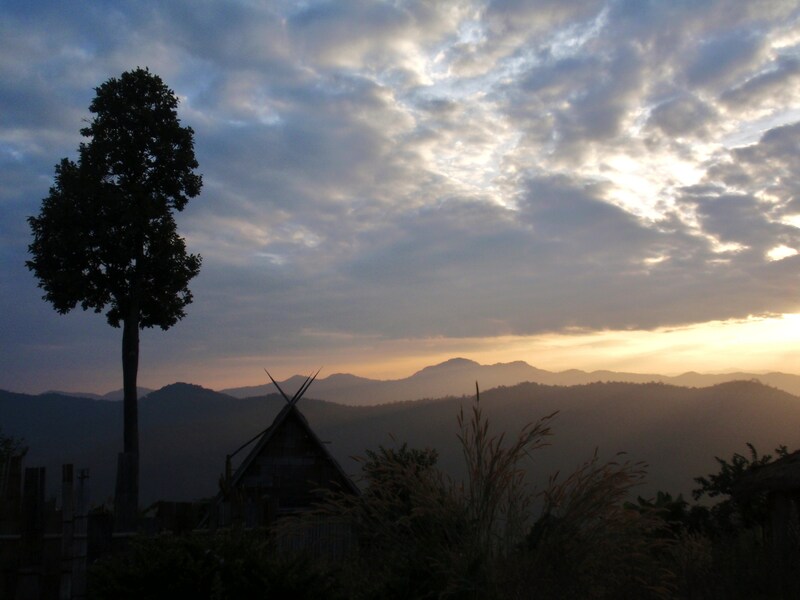 I slept in a village of Red Lahu, a self-sufficient group of farmers and crossbow hunters (also productive poppy farmers, opium producers, and spiritual smokers – a problem the Thai government struggles to control). In the Lahu family tree, husbands and wives marry and divorce several times. Polygamy is widely practiced in this community of 70 or so families. As a result, clans of small children wander the red dirt roads and lounge in packs on haphazard cloth hammocks. The football field was packed with barefoot, bare-chested boys cradling the ball towards a makeshift goal while girls sat on the side sifting dry beans on a large thatched disk. On this three-day tribe trek, our guide’s name was Blake. This had me questioning how Asians chose their Western names. Nevertheless, Blake’s family was of the nearby Karen tribe (the most populous and prosperous in the region) although he was raised in downtown Chiang Mai. He had a sister in San Francisco and dreamed of going there one day to listen to good American hip hop. He was confused that I didn’t like 50 Cent, “but all Americans are hip hop,” he said with some obligatory gestures. Not long after we parted with Blake, KNPP ambushed another Burmese military convoy of 20 government trucks, killing several technicians who were working on a nearby dam construction project. I can only guess where Blake is now, acting as a guide for a different sort. 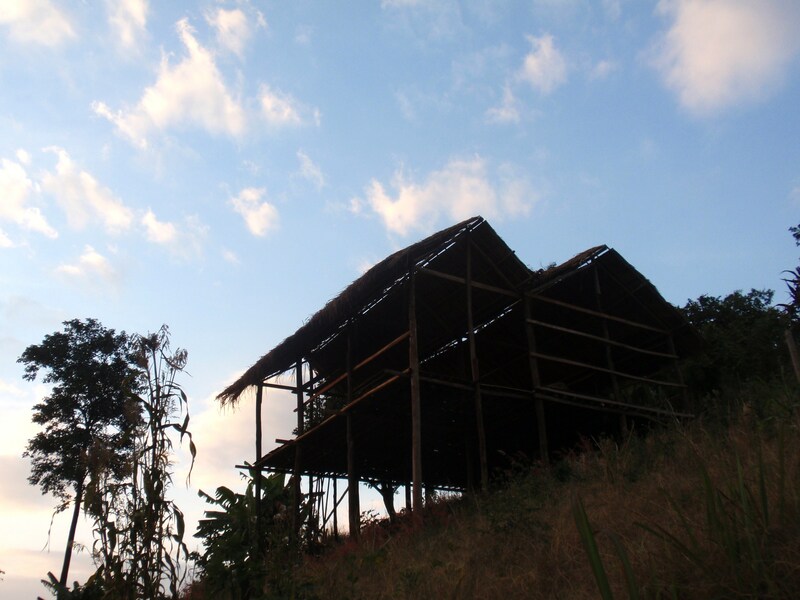 At midday, after a starlit evening in the Lahu village, we descended the far side of the mountain. The brusque chill of the alpine night melted into blistering-blue sunshine as the mountaintop scrub grew into dense forest. 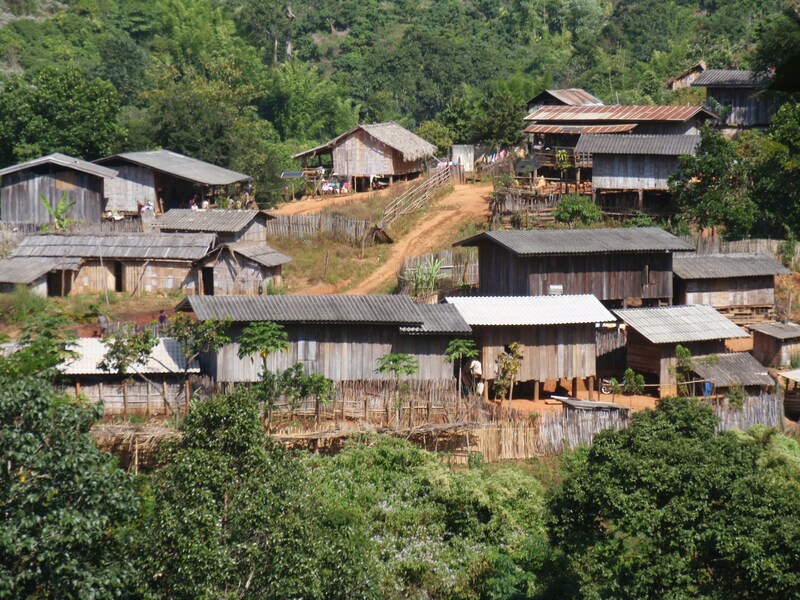 By early afternoon, we reached a village of the Hmong ethnic group. 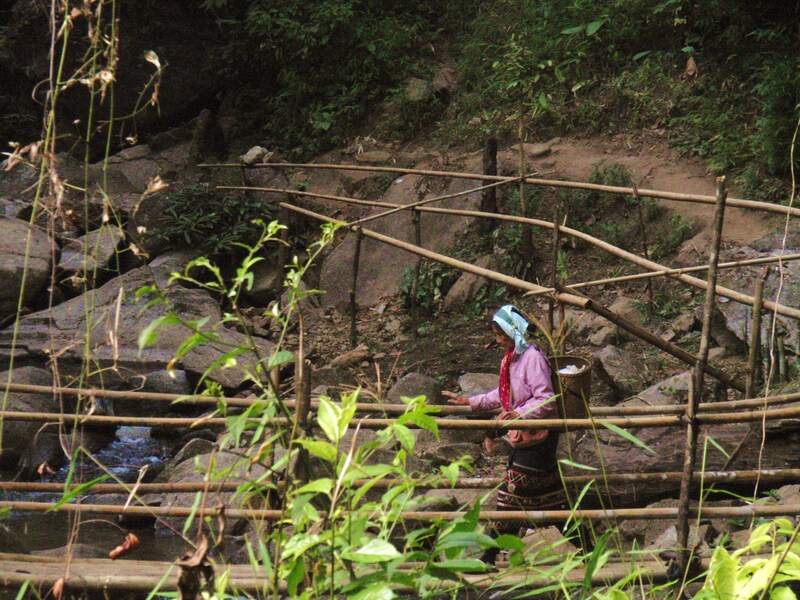 Believed to have been the original inhabitants of the Yellow River Valley in ancient China, the expansion of neighboring Chinese and ensuing wars led the Hmong to migrate south. Their riverside settlement had a distinct Chinese flair and small-scale bustle of modern China. 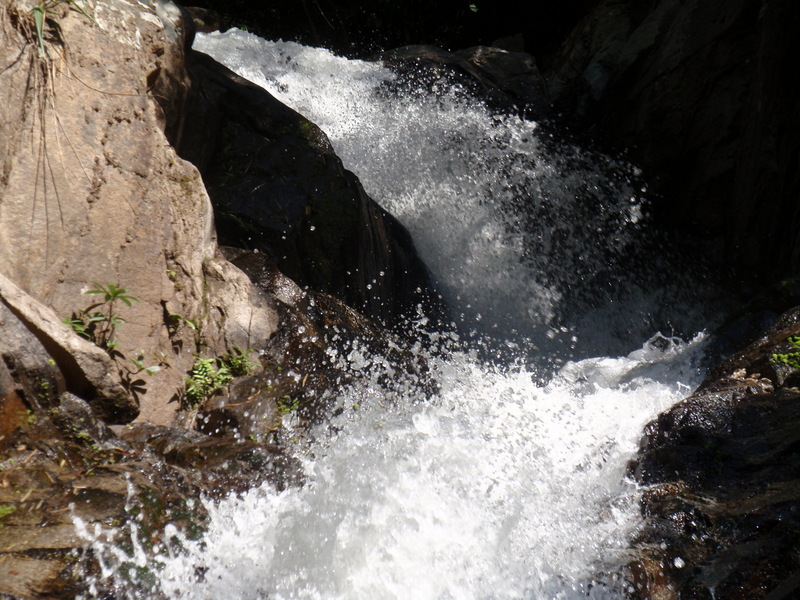 Further into the valley, we stopped to swim under the pounding force of a two-tiered waterfall. Thatched houses nearby could barely contain the bouncing kids who sold refreshments while simultaneously begging for our snacks. I sat for a late lunch by the river watching a chicken chase after frolicking yellow butterflies. A small girl danced the butterflies away and joined me by the rocks. Soon after, she stripped off her clothes and jumped cannonball into the water, collecting some drifting rubbish. Returning to the riverbank, she sat with the trash like new toys, arranging each piece in its proper place in the sandbox. She looked at me with a wild smile when suddenly she reached for a large stone and bashed her collection of new toys. Giggling hysterically, she grabbed her clothes and ran away. For our final night, we slept further down the river in a small camp run by local villagers. With the Lahus, we had the distinct luxury of an automatic (cold) shower. At the camp, we got a bucket of water and a scoop. It was a refreshing touch of the true tribal life. 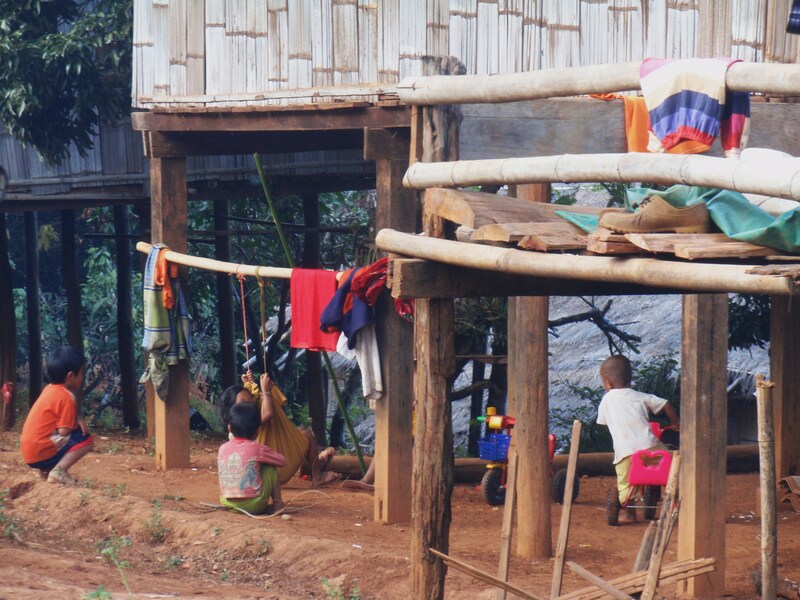 My trip into the hill tribes of northern Thailand was by no means a telling portrait of their world. I was given a glimpse of the lives of groups who’ve opened their arms (and pockets) to tourism in hope of a better life – a glimpse at groups who’ve allowed themselves to become an exhibit. From the start, I wasn’t sure if I wanted to go on this trip. There were freakshow photos of long-necked women in exotic attire hanging in glossy finish above every travel desk in Bangkok. The intrigued travelers were bussed north on ridiculously cheap package tours with bamboo rafting and elephant rides to flesh out a busy itinerary when the cameras were not pointed squarely at naked babies and ethnic ladies. Intrepid trekking groups were kept at a safe distance from each other to give the affair a dash more integrity, but it still felt under the big red tent. In our shrinking world, it takes more homework to find a taste of the truly tribal. Authenticity does not come so neatly packaged. If anything, the hill tribes were an amuse bouche, a sample of what was to come as I stepped back in time and into Laos. MarkontheMap is growing and getting more views than ever! Thanks for continuing to check in. If you’ve been reading for a while, why not recommend the site to a friend or sign up for a subscription by clicking on the link in the sidebar. Also, as the site expands, check out some of the new features like the top ten lists and free travel advice. As always, keep on sending your comments and feedback and thanks for reading! I’ve never been to a Canadian restaurant. I’m sure that they exist, but I’m not sure what exactly they’d serve. The international culinary map is marked with such thick borders. We’re spoon-fed lentils from Morocco and finger our way into Ethiopia’s injera but don’t dare to sample from elsewhere in Africa. We plow our way through a Brazilian barbecue and feast on Peruvian chicken, but would struggle to find South America’s other offerings. Each continent has its culinary ambassadors and a country’s size is no judge of its membership into this élite world of global gastronomy (when was the last time you went to a Russian restaurant?). In Asia you have the big guns India and China fighting over the buffet sector, Korean BBQ hitting the middle road, and Japan and Thailand reaching for upmarket chic. Most countries whose food makes its way into our neighborhood shopping malls and big city streets are either rich and powerful or large and numerous. There are obvious exceptions to this rule and I have always wondered why these small counties food gets noticed. Are they that different from their neighbors? If you asked me one year ago what my favorite food was (other than pizza), I would have said Thai food. It’s funny how you can come to love this one thing about a country so much and have no idea of its origins, preparation, or even ingredients. Why have I grown up eating Thai food and not Lao, Cambodian or Burmese? After a month overdosing on rice and noodles and an intense day of cooking instruction, I have discovered some of the answers. Appropriately, my lesson began in the market. At a table lined with rice-filled bamboo baskets, we learned to differentiate the plain (red, brown, basmati, jasmine) from the sticky varieties – the refined from the unrefined. Across the way, behind buckets of premade curry pastes in a traffic light formation of red, yellow, and green, a primitive machine squawked as it pressed and pumped out cream from furry brown coconuts. Most Thai dishes begin with oil. It is important to cook with the most tasteless oil available and we were shown palm and soy to use depending on the cooking temperature. Our instructor Tommy, an unusually buff Thai, warned us never to succumb to our Western tendencies and overpower Asian cuisine with olive oil. Teaching us where to shop in the curiously tidy market, Tommy led us around to another stall to locate Oyster, Mushroom and Fish sauce – the three main flavors in noodles and stir-fry. 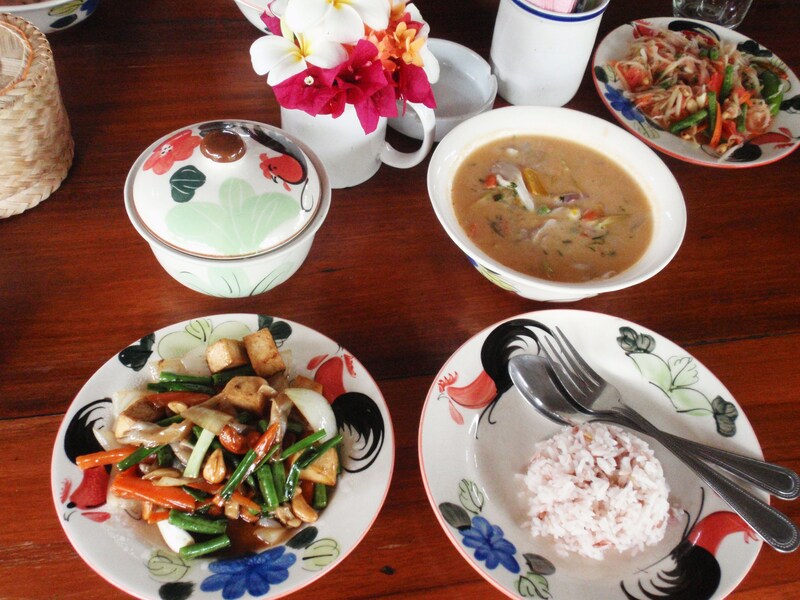 He assured us that a hint of fish sauce is essential in every Thai dish. 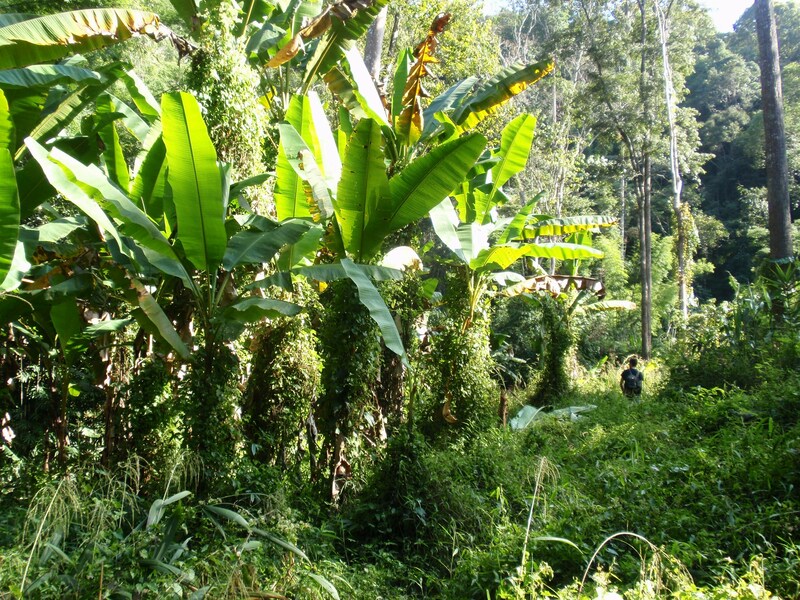 From the market, we drove sixteen kilometers north of Thailand’s second city, Chiang Mai, to the organic farm. 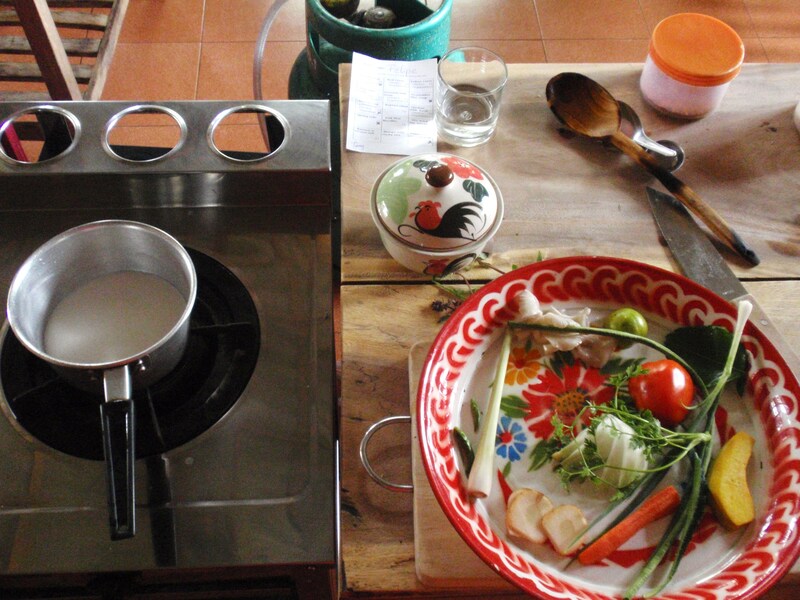 It was at the farm that we would cook our dishes. Wandering through the effervescent garden, Tommy pointed out the staple ingredients. It was important to know the look, smell, and flavor of each item we used to tailor our dishes to our own personal taste. 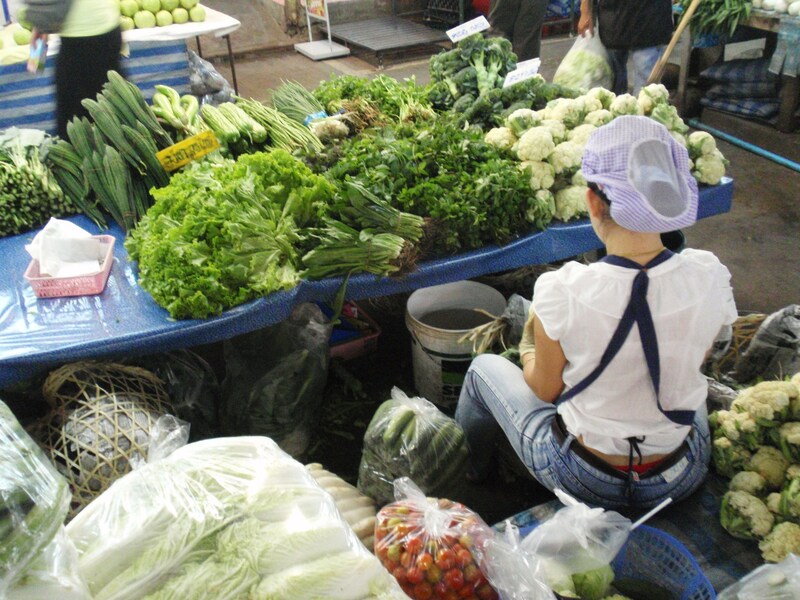 Thais use two kinds of lemons (limes), the traditional one found in our supermarkets and the lumpy Kaffir. Each has a different purpose. The traditional lime is utilized for its juice while the Kaffir’s leaves and skin add essential flavor to curries and noodles. 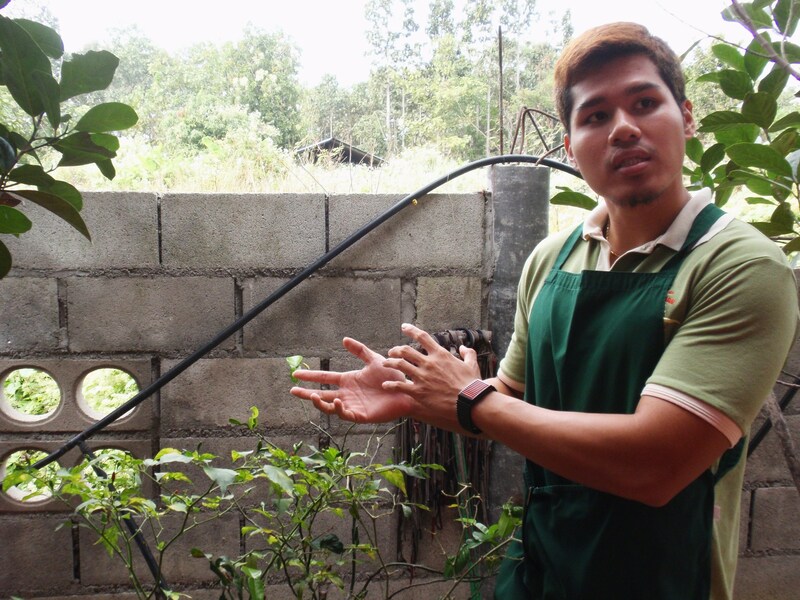 Around the garden we were introduced to roots and herbs both familiar and exotic – three types of basil (they favor holy), Thai ginger, ginseng, lemongrass, long bean, coriander, and most important – chili. 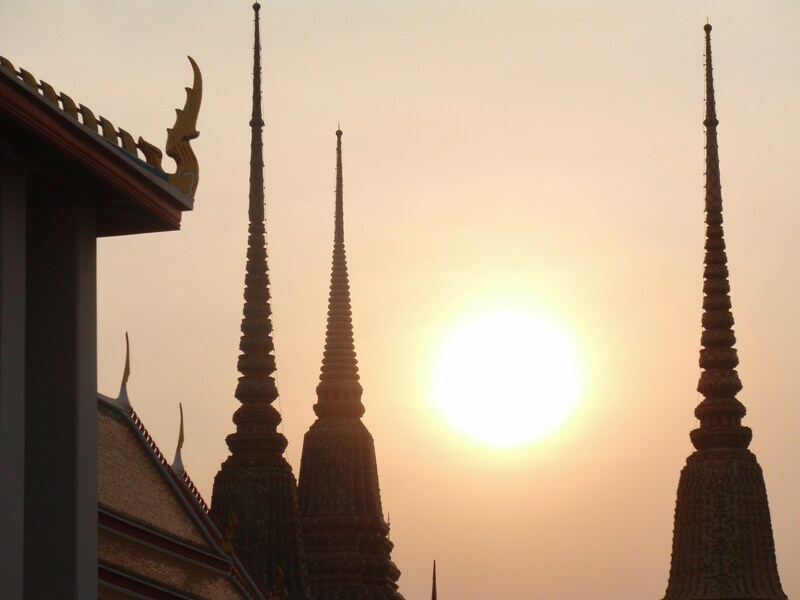 Thais are known for the heat infused into everything they cook. Instead of salt and pepper, their tables have chili sauce and chili flakes. Instead of catsup, they use chili paste… and the food is already hot. The smallest chilies pack the most punch and the more you chop one up, the more the flavor disseminates. If you don’t want the dish too spicy but still want the flavor, Tommy recommended choosing a larger chili pepper and removing the seeds. In the end, the test of a well cooked meal is a spoonful with equal parts sweet, sour, salty, and spicy. Thai men measure a woman’s prospects for marriage by her curry paste. She must be strong and sturdy enough to pound a paste out of spurting roots and spices. This is a tiresome task and I can attest that I would make a horrible Thai wife. 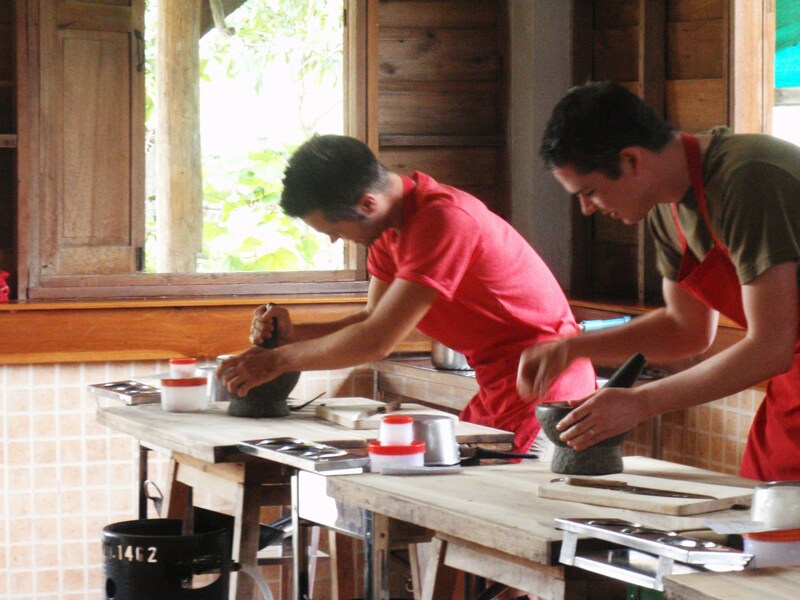 Muddling a paste with the pestle was the first step in our five course class and it was also the hardest. Red curry is my absolute favorite Thai dish so I was doubly disappointed that it was my poorest result. The coconut milk should be cooked on medium to maintain a liquid base and mine was as thick as peanut butter. If you’d like to outdo me (and it won’t be hard) try the recipe at the end of this post. 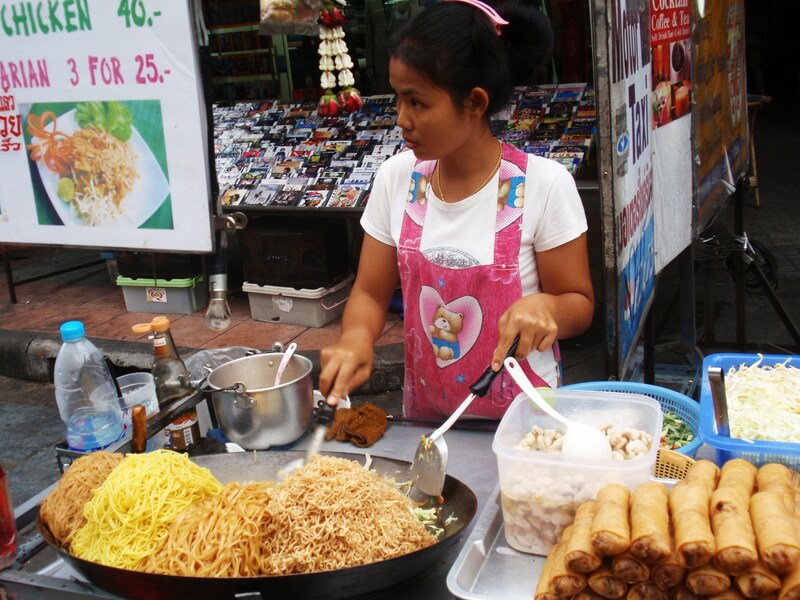 In Thailand, there is no such thing as a low-carb diet. Carbs are all there is to eat. My five courses at cooking school included curry (with rice), coconut soup (with noodles), chicken stir-fry (over rice), spring rolls (with rice noodles), and mango (on a bed of sticky rice). Rice and noodles! 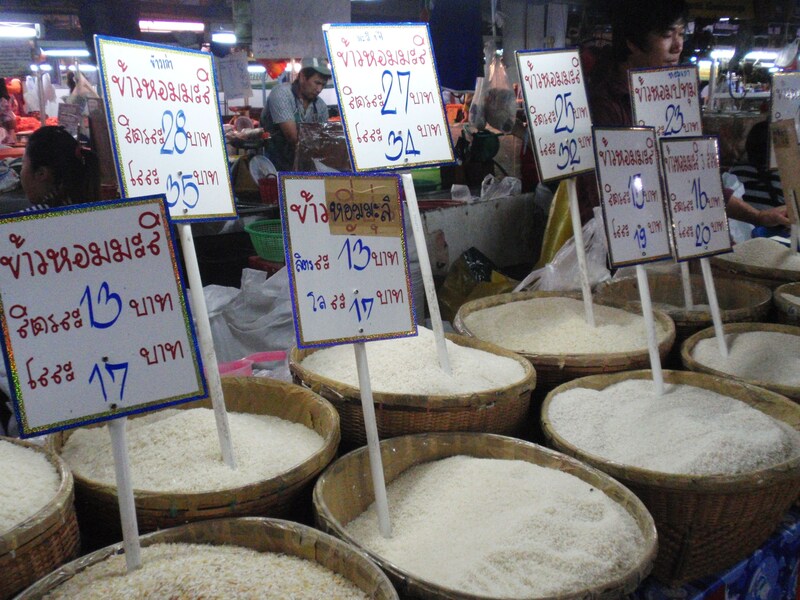 In the month I spent in Thailand, each day’s big decision revolved around rice or noodles? If you are curious what I ate this holiday season as you sent a toast of wine atop your honeyed ham, the answer is rice or noodles (with a toast of whiskey, rice whiskey!). Stir-fry is a typical dish for most of us, so I thought I had this one down. For me, stir-fry was a lazy process – a progression of vegetables based on cooking times. The thought had never occurred to me to chop each vegetable in such a way that together they would cook equally. In Thailand, this typical street food is fried on high for three minutes of dramatic flip-floppery by chefs who wield spatulas like weapons against popping oil and piping flame. What took me thirty minutes should take three. Stir-fry is a race against time and a talent I have yet to acquire. I have no advice on this one because, again, mine was a mild failure. If you’d like to try pad thai at home check out the recipe at the end of this post. After gobbling down some mango sticky rice and cleansing our palates with fresh lemongrass tea, the class was over. We removed our red aprons, bagged up a stack of leftovers, and collected our recipe books with everything (except Tommy) inside. This was my first cooking class, Thai or otherwise, and if I learned anything, it’s that I’ve been doing so many things wrong. I am top chef of the casserole and master of the oven, but Asian cuisine is all about the stovetop and this is a whole different field of expertise. It takes quick-thinking, a bit of flair, and a lot of rice and noodles. ***Unless you are an aspiring Thai wife, save yourself the trouble and buy red curry paste in the international section the supermarket! Pour the coconut milk in the pot and turn on to medium heat. Stir until oil appears. Add red curry paste and chicken and stir until almost done. Add your vegetables, water, sugar, fish sauce, soy sauce, salt and turn the heat up. Stir a little. When everything is cooked, turn the heat off and put the sweet basil and lime leaves in. Serve over rice. Heat up the oil on the wok on medium heat. Place tofu and fry until crunchy. Then, turn the heat down to low. Add garlic, pickled radish, shrimps, chili powder and stir until fragrant. Add vinegar mix and noodles and turn the heat up to medium. Stir-fry until the noodles are soft. Turn the heat down to low. Make a place by moving the noodles to another side of the wok. Add the egg and scramble. Add fish sauce, sugar, salt, crushed peanuts, bean sprouts, and leek (or spring onion) and turn the heat up to high. Stir-fry thoroughly until well mixed. Serve with a piece of lemon (lime) and fresh salad.